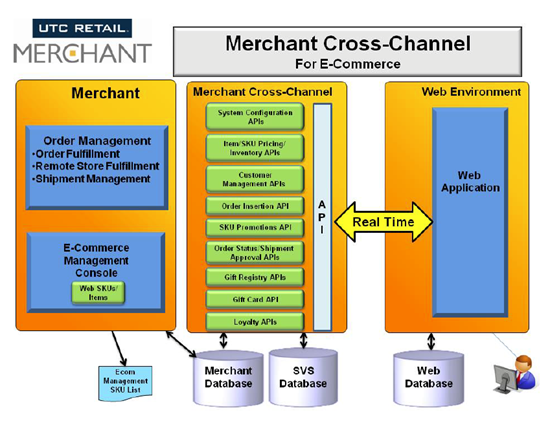 The Merchant Cross-Channel API (Application Programming Interface) is an extension of Merchant Store which allows 3rd-party applications to access Merchant Store's business functionality through a web service interface. This interface is designed to give other sales channels, particularly ecommerce applications but also emerging channels such as line-buster and mobile POS, the ability to interact in real-time with the Merchant system, including item querying, inventory availability, pricing, and order management. The initial release focuses on supporting E-Commerce web applications that wants to sell merchandise that is defined and maintained in Merchant to web customers. The purpose of this document is to describe how to use the Merchant Cross-Channel APIs to support the business functions of your web application. The manual provides overview of the functions supported through the various API's, the data structures that it supports and the contents and relationship of the data provided. The documentation does a nice job of defining the integration and API calls needed to integration UTC with your website. This sort of openness is a real plus for not only the website developer but also POS provider!